The outcome of U.S.-China trade talks will be key to whether oil prices can continue to rise, analysts say. Oil prices are rallying for a sixth straight session, clawing back gains after falling to 1½-year lows last month. The trade dispute has raised concerns about slowing economic growth and weaker oil demand. The outcome of trade talks between the United States and China this week will play a major role in determining whether oil prices can continue to rally, analysts tell CNBC. Oil prices have risen for six straight sessions, clawing back gains after falling to 1½-year lows last month. 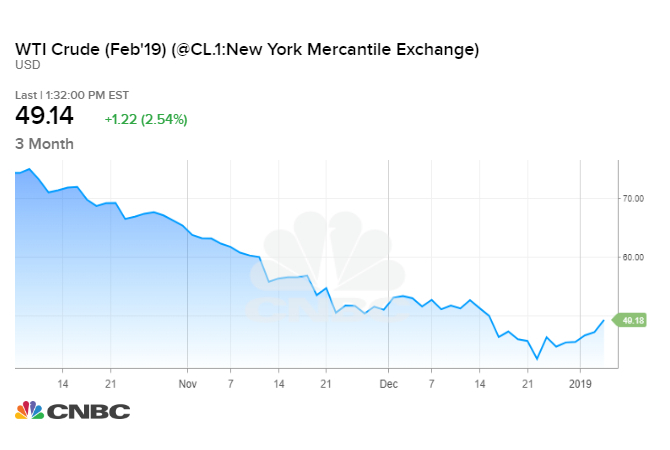 The cost of crude collapsed more than 40 percent between early October and late December on concerns about slowing economic growth and oversupply in the oil market. Amrita Sen, chief oil analyst at research firm Energy Aspects, thinks crude futures have more room to run, but says the recovery is on shaky ground. "I think as long as the global economy isn't collapsing, we should be able to climb a little bit higher, but it is going to be very fragile because the biggest, biggest uncertainty right now is the trade war going on between the U.S. and China," she told CNBC Europe's "Squawk Box" on Monday. U.S. and Chinese trade representatives are meeting Monday and Tuesday to negotiate a path forward in the nations' ongoing trade dispute. The two countries have slapped tariffs on hundreds of billions of dollars worth of one another's goods. Additional tariffs threaten to weigh on global economic growth, and consequently, demand for oil and fuel. This comes at a time when forecasters have already warned that oil demand will grow more slowly than previously anticipated in 2019. According to Sen, oil prices fell too far, too fast, largely due to technical factors such as automated trading strategies. On the supply side, production cuts by major oil producers and slower-than-expected U.S. output will help oil prices recover, she says. Whether or not the market is oversupplied will largely boil down to demand. "At current levels, based on current fundamentals, the market is oversold," Sen said. "But it doesn't mean that it's going to correct straightaway, right? It can still take some time, unless and until you have the clarity, particularly with the trade talks over today and tomorrow." The main driver for oil prices right now is the strength or weakness of broader financial markets and the mood around the economy, says Vandana Hari, founder of energy markets consultancy Vanda Insights. Whether or not OPEC and other major producers including Russia will stick to their production cuts is now a secondary concern, in her view. In the coming days, oil prices will likely follow stocks on news from the U.S.-China trade talks, Hari says. But she also expects sentiment about the ongoing negotiations and underlying economic concerns to steer oil prices for the next few months. "From an oil markets perspective, what would be very important to keep in mind is this is going to be a highly volatile environment," she told CNBC Asia's "Squawk Box." "Today and tomorrow are the first days of the talks this year, but then these are expected to continue. Nobody is expecting a huge breakthrough or a complete solution to this any time soon."